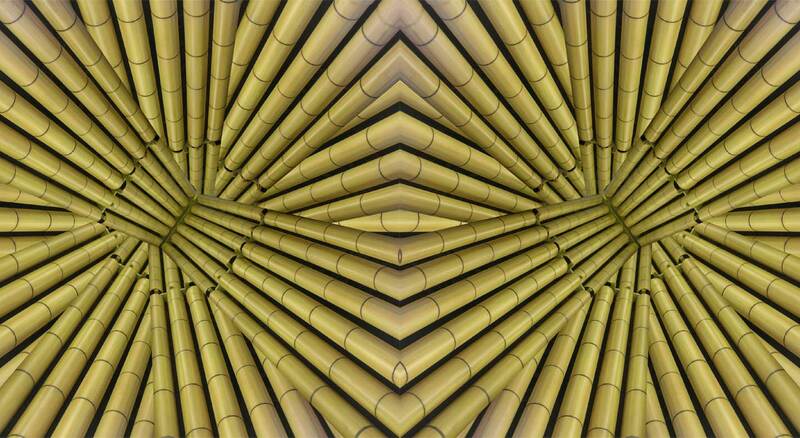 Remember the various names of Bamfaux are Imitation Bamboo, Synthetic Bamboo ,etc. Click below to quickly move to that section. Where can Bamfaux be used? Bamfaux (Imitation Bamboo) is ideal for Asian, African and Tropical Exhibits, at Zoos, Water Parks, Amusement Parks, Resorts and Expos, as well as the Entertainment Industry (offices, residential and/or commercial). See this web page for several pictures. As decor Bamfaux is extremely versatile. It fits into almost any scene and it can be colored to match your Persian rugs, your Graffiti wall, your cane furniture, or your kitchen tiles. Your imagination can conjure up your own specific style, trend or preference. With the use of silk foliage you can create your own lasting bamboo forest. What are the general specifications? Our Bamfaux is finished off with a UV-stabilized, acrylic, clear coat finish that is almost immune to outdoor weather conditions. It gives the pipe a matt finish, diffusing the usual glossy paint finish, plus it helps our Bamfaux withstand weather conditions like sunlight, rain and humidity. Bamfaux does not flake, go gray or soften in the rain. 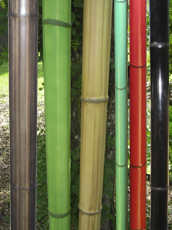 Exotic Imitation Bamboo colors are: Original (natural), Black, Green, Blue, Red, Yellow and Customer Specific. Bamfaux (Synthetic Bamboo) is hollow all the way through. Imitation Bamboo lends itself to be used as a slip cover over metal or wood. It cannot sustain any load but it can protect or hide the upright that does. The long Bamfaux poles are fairly rigid, yet over their 20' length they have some give and a slight curve, more so with the thinner diameters. Synthetic Bamboo is available in diameters ranging from 1/2" to 16", and any length up to 20ft. All the enhancements on Bamfaux is done by hand. Expected lifespan of Imitation Bamboo outside in sunlight is 3+ years, while Interior Synthetic Bamboo should last 5+ years. Bamfaux is made from PVC (Polyvinyl Chloride) that does not burn (it melts from very high temperatures) so it does not need fire retardant. Can be joined with standard Imitation Bamboo pipe fittings. Bamfaux is made in America. What is good about PVC? Some of the benefits of PVC include, Flame Retardance, impact resistance, ease of fabrication, rigidity, moisture resistance and excellent outdoor weather ability. Because PVC is highly resistant to oxidative reactions, its durability is superb. PVC can be recycled. Because of the physical properties of re-converted products are virtually the same as those made from virgin PVC resin. PVC's ignition temperature is as high as 455oC. PVC has a good dialectic strength, which means it can withstand a good amount of electric field strength without its insulation properties breaking down. Although PVC dissolves or swells in aromatic hydrocarbons, ketones and cyclic ethers, it is difficult to dissolve in other organic chemicals. It is resistant to almost all inorganic chemicals. What are the Specific Specifications? NFPA Class A, UBC class I, Flame spread between 0 through 25 - Bamfaux's flame spread tested at 5. PVC piping systems are self-extinguishing and will not support combustion. Per ASTM E 84, PVC does not meet the 25/50 Flame and Smoke requirements for plenum application. It requires extra airflow. ASTM D635 - Standard Test Method for Rate of Burning and/or Extent and Time of Burning of Plastics in a Horizontal Position. ASTM D638 - Standard Test Method for Tensile Properties of Plastics. ASTM D648 - Standard Test Method for Deflection Temperature of Plastics Under Flexural Load in the Edgewise Position. ASTM D790 - Standard Test Methods for Flexural Properties of Unreinforced and Reinforced Plastics and Electrical Insulating Materials. ASTM D792 - 08 Standard Test Methods for Density and Specific Gravity (Relative Density) of Plastics by Displacement. ASTM D2766 - Standard Test Method for Specific Heat of Liquids and Solids. ASTM E 84 = Standard test method for surface burning characteristics of of building materials. ASTM E162 - Standard Test Method for Surface Flammability of Materials Using a Radiant Heat Energy Source. Plenum = enclosed spaces (in buildings) used for airflow. UL 94 - a plastics flammability standard released by Underwriters Laboratories of the USA. The standard classifies plastics according to how they burn in various orientations and thicknesses. From lowest (least flame-retardant) to highest (most flame-retardant). V0: burning stops within 10 seconds on a vertical specimen; drips of particles allowed as long as they are not inflamed.